MELBOURNE, Australia (AP) Australia named an unchanged 23 for Saturday’s second rugby test against Ireland after winning the first match 18-9 last weekend in Brisbane, while Ireland made eight changes. 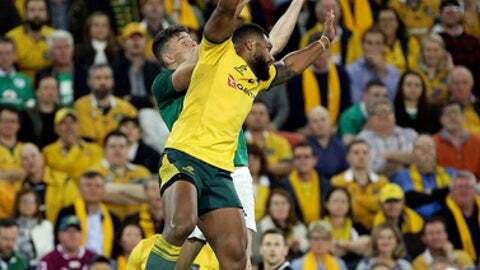 Rugby Australia said Thursday that coach Michael Cheika resisted the urge to change a winning formula despite the return of flanker Ned Hanigan (knee injury) and lock Rory Arnold (suspension). It marked the first time that Cheika has named an unchanged 23 for back-to-back matches in his 46 games in charge of the Wallabies since taking the head coaching job in November 2014. Star playmaker Johnny Sexton, meanwhile, returns among the sweeping changes to Ireland’s starting team. Sexton replaced flyhalf Joey Carbery, re-establishing his successful scrum-base partnership with halfback Conor Murray. Coach Joe Schmidt made big changes to his forwards with a new front row of Cian Healy, Niall Scannell and Tadhg Furlong while Dan Leavey comes in at openside flanker ahead of Jordi Murphy and Devin Toner joins James Ryan in the second row. Outside center Gary Ringrose comes in, with Robbie Henshaw switching to inside center and Andrew Conway takes over on the right wing from Jacob Stockdale. Defense coach Andy Farrell said Ireland was left ”angry” by the Brisbane loss which ended the team’s 12-match winning streak which had seen it win the Six Nations title and Grand Slam. The third and final match in the series is scheduled for June 23 in Sydney. Australia: Israel Folau, Marika Koroibete, Samu Kerevi, Kurtley Beale, Dane Haylett-Petty, Bernard Foley, Will Genia; Caleb Timu, Michael Hooper (captain), David Pocock, Adam Coleman, Izack Rodda, Sekope Kepu, Brandon Paenga-Amosa, Scott Sio. Reserves: Tolu Latu, Allan Alaalatoa, Taniela Tupou, Rob Simmons, Lukhan Tui, Pete Samu, Nick Phipps, Reece Hodge. Ireland: Rob Kearney, Andrew Conway, Garry Ringrose, Robbie Henshaw, Keith Earls, Johnny Sexton, Connor Murray, C.J. Stander, Dan Leavy, Peter O’Mahony (captain), James Ryan, Devin Toner, Tadhg Furlong, Niall Scannell, Cian Healy. Reserves: Rob Herring, Jack McGrath, Andrew Porter, Tadhg Beirne, Jordi Murphy, John Cooney, Joey Carbery, Jordan Larmour.